What a wonderful way to finish 2016 - with a project that I'm super proud of and can't stop talking about. I was happy to partner with the Dying Light Collective, partly because I got to work with my partner, Matt, and partly because they were able to make it look a lot better than I would have on my own. I was in charge of building the sculpture and they made the lights run. 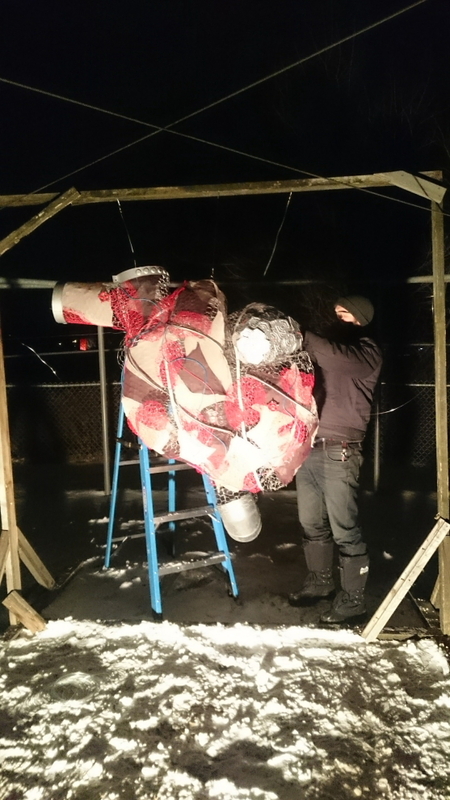 Our local Edmonton Valley Zoo has been hosting a winter light festival called Zoominescence for a few years, but this was the first year they invited artists to submit projects. We sent in a proposal back in July and were pretty excited when it was accepted. Our idea was to build a large anatomical heart with light flowing in and out of it to represent blood. The theme that they gave us was renewable energy so we wanted to set up a mechanism where people would generate the power needed to run the lights. It didn't turn out exactly how we wanted but we were still happy with it in the end. Like many of the projects I've done this year, I had no idea what I was doing going into this. 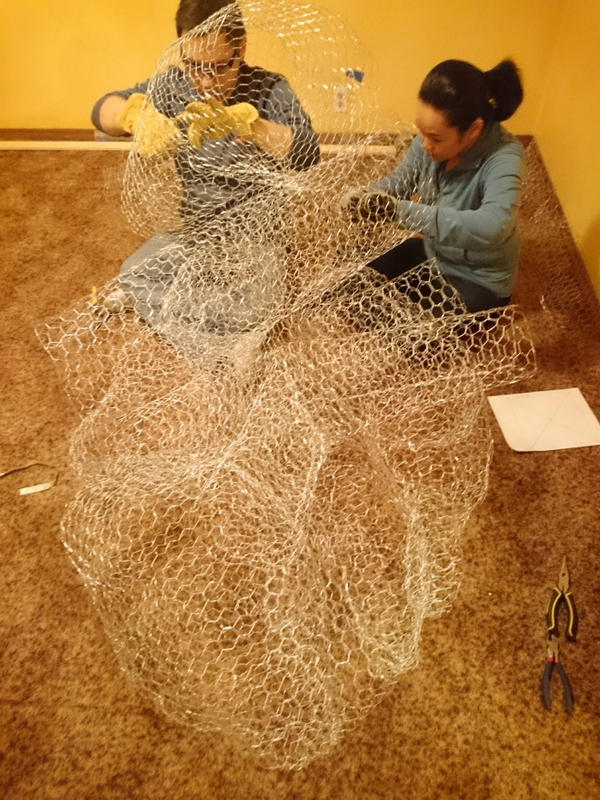 I've made sculptures of hearts before, and I've made chicken wire frames before, but the idea of making a giant chicken wire heart was daunting. I also knew that I wouldn't be able to finish the project on time if I didn't recruit help and that meant that not only was I going to have to figure out how to make this thing, I was going to have to tell others what to do. Thankfully the friends that offered to help were super smart and capable and figured out a lot so that I didn't have to. I gave them a general direction, "Make this shape!" and they did it. I felt so lucky that these friends were willing to give up their time to help, and couldn't have done it without them. I started by building the heart out of chicken wire. I wanted it to have some depth so I build each chamber of the heart separately and then attached them together. When it was all assembled it looked pretty great, but I knew that the chicken wire by itself would disappear against a background so I set about figuring out how to cover it. First, though, I pulled a string of LED lights through to see how it looked. This was very exciting. We got some stretchy fabric and stitched it on in rough, jagged pieces. I was inspired by the way that hides look when they're drying - tacked and stretched apart. We also found this amazing red fabric that added some lovely texture. Next came the really fun part. I wanted the heart to look like a mix of organic and mechanical so I went to the Habitat for Humanity Restore to see what kinds of mechanical odds and ends I could find. I came home with a huge box and started adding them to the heart: red and blue wire, pieces of ducts, hoses, and these wonderful metal hexagons that someone said were for holding insulation in place. The team put together the long "tentacles" (otherwise known as veins and arteries) that came out of the heart, and we bought out two Home Depots' supply of dryer tubes to put the lights in. Matt and his team spent the week leading up to the festival trying everything they could think of to make it possible for people to turn a crank and generate enough energy to run the lights. Our living room turned into a laboratory, complete with mad scientists working late into the night. In the end, visitors would have had to turn the crank at 100 RPM for four minutes to generate enough energy for the lights to run for one minute. It wasn't feasible. It was disappointing but it ended up working out okay. It fit with the renewable energy theme even better than we expected because it teaches people the true cost of electricity: you get tired of turning long before the lights come on and it helps demonstrate how much energy even a simple light requires. I'm sure that with more time they would have gotten it figured out but I'm quite happy with it as is - and quite impressed by all the work they did. So much of this project was completely beyond my skill set and, once again, I'm grateful that I was able to work with such technically minded folks. We hit another obstacle when the temperature dropped to -25 the day we we started installing the project at the zoo - you can see Matt's frozen beard in the picture above. We were worried about the lights breaking or not functioning, and personally I had a really hard time keeping my hands warm enough to work. Somehow it came together though, and after several frozen evenings it was ready to show the public. I had never been to Zoominescence and was pleased with what a wonderful festival it is. There are eight other installations and on opening night we got to meet a few of them and share our struggles with the cold. All the indoor animal enclosures were open for viewing and we took different groups of family and friends around to see our favourites. Thank you to David, Kelly, Derek, Ryan, Carina, Devon, and Telena for all your hard work. This was never my project - it was a team effort from day one and I couldn't be happier. P.S. The Dying Light Collective is a super cool non-profit that Matt and two other founders have started here in Edmonton. Their dream is to create a place where people will have access to the space, tools, knowledge, mentorship and community they need to follow their inspirationg. They want to make these things accessible to everyone so that anyone can learn to build anything. I couldn't have done this project without their help and I wholeheartedly believe in their mission. P.P.S No blog post next week since I'm taking a week off for Christmas. If you're looking for more behind the scenes posts check out my window display, my Courage Gala commission, or my lamppost installation.